← Why I love Sister Wendy…. 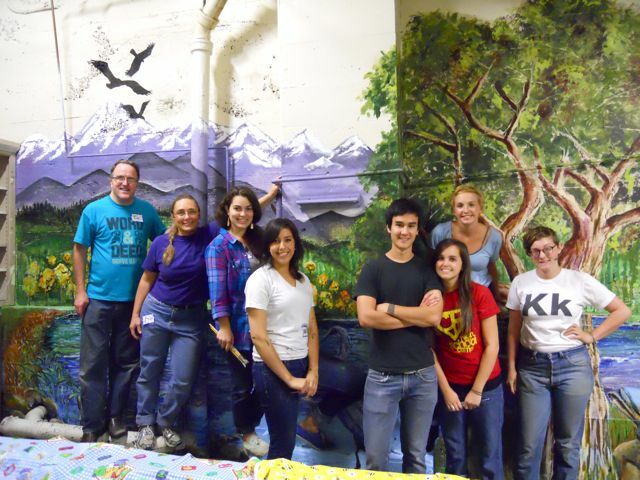 Here is the team (from left to right, me, Janelle, Ali, Karina, Seth, Leah, Meghan, and Morgan) in front of the majority of the mural when it was complete. Seth and Leah came up with the over all design of it. A couple of weeks back I had the honor of heading up a team of wonderful students and some select employees from George Fox that went to downtown Portland’s Rescue Mission to help out with some service projects and also to paint a mural in the men’s rec room. Every year George Fox sends out its entire campus population for a day do acts of service in the community. This is the seventh year I have participated in the event, and the third in which I was able to head up a group of art students that were able to use thier artistic skills in service to others. 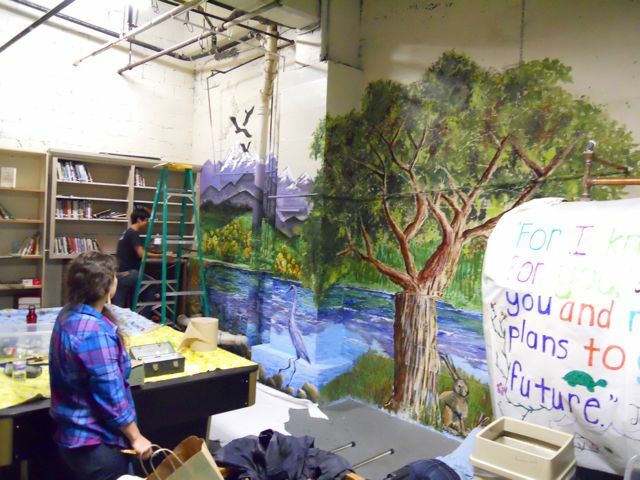 The team was able to crank out the mural in an impressive five hours at the Portland Rescue Mission on Burnside. The folks working at the mission were an absolutley wonderful group of people (one of which I found out got his MFA in SanFransico). I was struck at the sense of mission, purpose, heart, tenacity, and clarity that they have as they serve the homeless in Portland. It was an honor to work with them for a day. Our hope is that the mural we created will provide a bit of refuge too for those in the community, it was a blessing to see a glimpse of the work they do. Working away on the mural, we did have a very large water heater that was covered in scripture that we had to contend with. Some of us wondered if we could come back next year and paint it so it blends into the landscape we created on the wall. 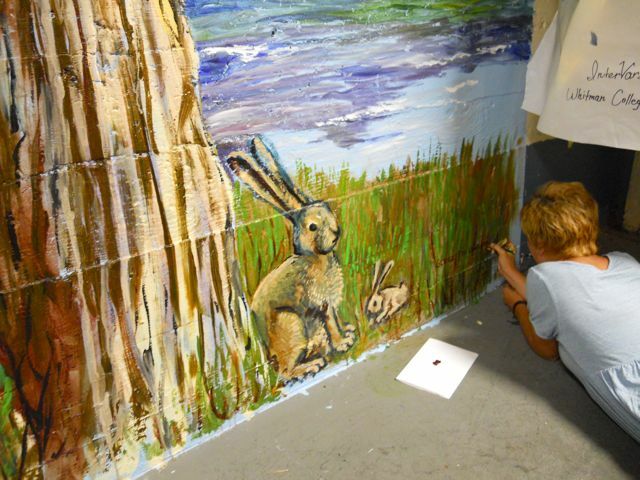 Meghan signing the piece for all of us by some rabbits I painted in the mural. 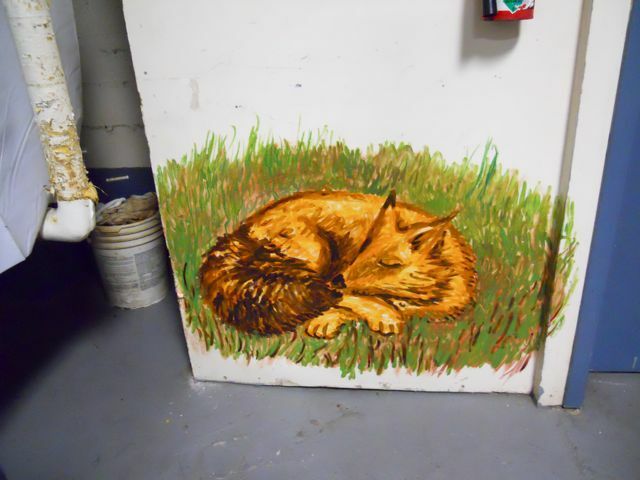 This entry was posted in Curious Endeavors and tagged art service project, helping others with art, landscape mural, mural painting, Portland Rescue Mission, serve day, serve day George Fox. Bookmark the permalink.